Very few companies can boast a corporate legacy spanning several decades. The well-known Rodenstock optical firm is one of those rare organizations. 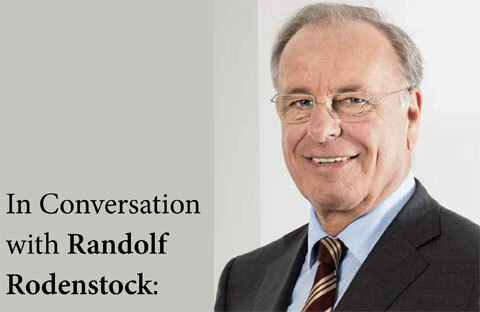 Randolf Rodenstock, who serves on the supervisory board of the Rodenstock Group, represents the fourth generation of the family business, which was founded by his great-grandfather in 1877. Last June, Rodenstock travelled toCanada to address audiences of opticians and optometrists at two events, one in Calgary and the other in Ottawa. The purpose of his visit was to forge a strong connection with Canadian optical professionals and to share his views on the evolution of the optical industry in this country. He was accompanied by Florian Zwink, an optical engineer and technical advisor for the firm, who spoke about digital technology as it applies to the industry. From a sales point of view, Rodenstock feels that a key change that has taken place in the optical industry over the past decade is the growth of retail chains, with the result that increasing numbers of consumers are being exposed to opticians’ expanding product offerings. Turning to eyeglasses, Rodenstock used the model of a triangle to illustrate what he feels are the three essential factors in vision improvement with eyeglasses: the top point represents glasses, and the left and right points refer to the wearer’s face and personality, respectively. For several decades, the Rodenstock Group has conducted a psychosocial survey to determine peoples’ perception of eyeglasses and what motivates or dissuades them from wearing eyewear. Rodenstock reported that, according to the survey results, roughly one-third of individuals know they need new glasses but won’t buy them. Their reasoning is that glasses will make them less likeable, less likely to be loved, and less attractive. The fear of changing one’s face is an additional concern. Forty to 50 per cent of those surveyed rejected the notion of wearing glasses and the balance of respondents said they were willing to learn about glasses and would consider using them as an expression of their personality. Rodenstock assured the audience that, “Rodenstock in Canada is here to stay. We realize the need to optimize our service. As a result, we’re entering a new phase of our presence inCanada.” Recent changes in the Canadian operation include the hiring of a new managing director, Jeremy Carvalho, whose mandate includes making such strategic changes as placing more emphasis on the Rodenstock brand. Carvalho has also been charged with reviewing the number of brands in the Rodenstock portfolio. The company’s current focus is finding ways to make individual free-form lenses more attractive to the Canadian market. Rodenstock broke this down into three elements: cost, delivery time and quality. In conclusion, he proudly noted that, as a brand, the company’s name signifies the concepts of improving peoples’ vision and enhancing their looks. Objectives to which the company will, no doubt, remain committed for decades to come.